Database/DBMS Interview Questions And Answers - Part XVII. Answer: To ensure integrity of data, the database system must maintain the ACID Properties. Atomicity: A transaction is either performed in its entirety or is not performed at all. Either all operations of the transaction are reflected properly in the database, or none are. It is the responsibility of the recovery subsystem of the DBMS to ensure atomicity. 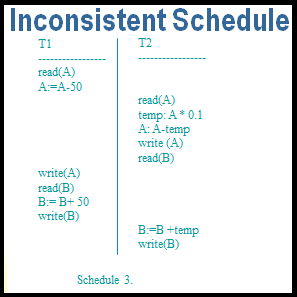 Consistency: A transaction must transform the database from one consistent state to another consistent state. Execution of a transaction in isolation (that is, with no other transaction executing concurrently) preserves the consistency of the database. It is the responsibility of DBMS and the application developer to ensure consistency. Isolation: Transactions execute independently of one another. It is the responsibility of the concurrency control subsystem to ensure isolation. Even though multiple transactions may execute concurrently, the system guarantees that, for every pair of transactions Ti, and Tj, it appears to Ti, that either Tj finished execution before Ti started, or that Tj started execution after Ti finished. Thus, each transaction is unaware of the transactions executing concurrently in the system. Durability: A successfully completed (committed) transaction is permanently recorded in the database. After a transaction completes successfully, the changes it has made to the database persist, even if there are system failures. It is the responsibility of the recovery subsystem to ensure durability. Answer: DBMS needs to make sure that all transaction schedules preserve the consistency of the database. 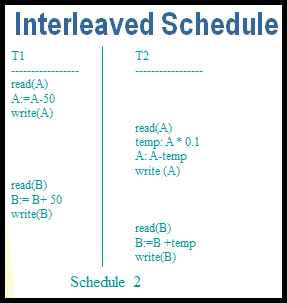 A schedule is the chronological order in which instructions are executed in a system. A schedule for a set of transaction must consist of all the instruction of those transactions and must preserve the order in which the instructions appear in each individual transaction. In schedule 1 the all the instructions of T1 are grouped and run together. Then all the instructions of T2 are grouped and run together. These types of schedules are called serial. Concurrent transactions do not have to run serially as in the next examples. Schedule 1 and 2 produce the same result even though they have different sequence. 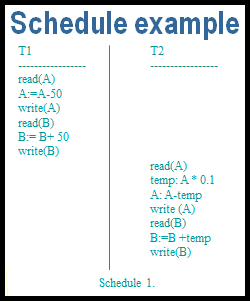 It could be shown that Schedule 2 could be transform into Schedule 1 with a sequence of swaps, so Schedule 1 and 2 conflict equivalents.